The promise of a nightmarish morning commute led many San Francisco Bay Area residents to use public transportation Monday, one day after a fiery tanker crash caused the collapse of a heavily-trafficked section of freeway. An elevated section of highway that funnels traffic from the San Francisco-Oakland Bay Bridge to a number of key freeways was destroyed early Sunday after flames from an overturned gasoline truck caused part of one overpass to melt and collapse onto another. Traffic into the city was largely flowing as usual Monday morning, except for drivers slowing on nearby interchanges to peer at the damage. But officials warned the afternoon drive would bring bigger headaches. The accident damages an essential interchange connecting the busy San Francisco-Oakland Bay Bridge to three major freeways, reports CBS News correspondent John Blackstone. Locally it's known as "the MacArthur Maze" for good reason: it's a tangle of roadways and overpasses which 280,000 vehicles a day pass through on their way to and from the bridge. On any weekday morning, traffic snarls on the approaches to the Bay Bridge, and Monday's jam did not appear worse than usual. But more severe delays were expected in the afternoon. "The most worrisome thing is the afternoon commute coming out of San Francisco toward the maze," said Jeff Weiss, a spokesman for the California Department of Transportation, "because the traffic from the Bay Bridge fans out from across three freeways. Taking away two-thirds of the capacity is really going to cause a bottleneck." Authorities said the accident would cause the worst disruption for Bay Area commuters since the 1989 Loma Prieta earthquake damaged the Bay Bridge itself. In declaring a state of emergency, Gov. Arnold Schwarzenegger authorized free transit Monday on the Bay Area Rapid Transit rail system, ferries and buses. "On April 30 everyone here in the Bay Area will get a free ride," he said Sunday. "The State of California will reimburse the transportation agencies." BART will be adding extra trains during the rush hour and adding extra cars to its trains. Parking lots at outlying BART stations like El Cerrito and Pittsburg-Baypoint filled up earlier than usual as commuters tried to beat the rush they imagined was coming. "I'm mad," said Crystal McSwain, who has a commuter pass to take the trans-bay bus, but was taking BART — a more expensive option. "My life is upside down, and I don't know how long it's going to take." While some trains appeared more crowded than usual, Bay Area Rapid Transit officials said overall ridership did not appear greater than normal as the Monday morning rush hour got under way. Riders were likely delaying their morning commute to avoid crowds, or staying home, BART spokesman Jim Allison said. "If you didn't know what the situation was, you might just assume it was any other day," Allison said. Leo Kay, a spokesman for the Environmental Protection Agency, took a bus from the East Bay to his office in downtown San Francisco. Like other riders, he craned his neck to catch a view of the crumpled freeway as the bus approached the Bay Bridge. "This is about the same as normal," he said of the traffic flow. "We'll see what the afternoon has in store." Standing near the wreckage Sunday night the governor said the state will respond quickly to rebuild the freeway. Schwarzenegger said he hoped the state will "cut through all the red tape and all the bureaucracy ... so we can get the work done as quickly as possible. After the Northridge earthquake it was within 60 days they rebuilt everything." 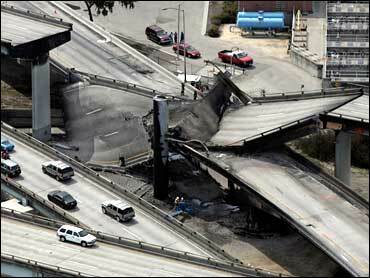 The 1994 Northridge quake in southern California damaged several sections of freeway in Los Angeles. The governor's emergency declaration will help streamline contracting and environmental codes to hasten cleanup and rebuilding efforts, according to a statement. California Department of Transportation director Will Kempton said intense heat from the flames caused the steel beams holding up the roadway to buckle and bolts holding the structure together to melt. The cost of repairs would likely run into the tens of millions of dollars, and the agency was seeking federal disaster aid, Kempton said. State transportation officials said it could take months to repair the damaged interchanges, and advised motorists to use public transportation in and out of San Francisco. They said drivers who chose to take alternate routes Monday would still face tough commutes. "People are going to have to find a different way to work and back home in the evening so we are asking them to plan ahead and do their homework," said Jeff Weiss, spokesman for the California Department of Transportation. "This isn't going to be fixed in a matter of days." Weiss could not give a timeline for getting the highway repaired and opened up again. "This is such a rare accident that we're a little bewildered," he told CBS Station KPIX correspondent Lisa Chan. Overnight, workers had already begun demolishing parts of the collapsed ramp, as well as shoring up a portion that was resting precariously. Though heat from the fire was intense enough to weaken the freeway and damage a stretch of highway hundreds of feet long, the truck's driver — the only injury — walked away from the scene, Officer Trent Cross of the California Highway Patrol said. Cross said that initial investigation is leading police to suspect that unsafe speed was a factor. According to CBS Station KPIX correspondent Joe Vasquez, the truck's driver, James Mosqueda, 51, of Woodland, was able to free himself from the wreckage and then wandered West Oakland for 30 minutes, "staggering in a daze of pain and shock," as he tried to wave down passing cars, one after another. No one would stop. Mosqueda finally wandered over to a gas station — 15 blocks from the accident scene — where a taxi driver saw him. "He walked up to me, he said 'I'm dying, I'm dying, I'm burning, I just had an accident,'" the taxi driver [who identified himself only as Anthony] told Vasquez. "I tried to calm him down." Anthony drove Mosqueda to St. Francis Hospital, refusing to be paid. "I said, 'I don't need the money, just hurry up, just rush in and get some treatment.'" Mosqueda is being treated for second-degree burns at St. Francis' burn unit. The driver's father, James Mosqueda Sr., told KPIX that his son has been driving trucks for three years with no problems and never had an accident. However, Mosqueda's trucking company, Sabek Transportation, was involved in an eerily similar accident on June 23, 2006, when 4,500 gallons of diesel was spilled on a highway connector ramp in Vallejo. Mosqueda was headed from a refinery in Benicia to a gas station near the Oakland airport when the accident occurred, according to the CHP. San Francisco Mayor Gavin Newsom said Sunday's fiery crash showed how vulnerable the Bay Area's transportation network is, whether to an earthquake or terrorist attack. Sunday's freeway collapse also has the potential to have a major economic effect on the city, he said. "It's another giant wake-up call," Newsom said. For KPIX's guide to commuting alternatives, traffic detours and maps, visit KPIX's Web site.